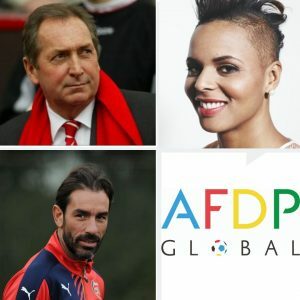 AFDP Global, the international football social enterprise, is proud to announce that today (5 March 2019) three renowned football stars have been appointed as the organisation’s first ambassadors. Gérard Houllier is an eminent French football manager and former player. In an illustrious managerial career, Houllier enjoyed six successful years at Liverpool, leading the club to a famous FA Cup, League Cup and UEFA Cup treble in 2001. The repertoire of historic clubs managed by Houllier includes the French national side, Paris Saint-Germain, Aston Villa, Olympique Lyonnais and Lens. Karina LeBlanc has the distinguished honour of being Canada’s longest serving international soccer player. Over a prestigious 18-year international career, LeBlanc represented her country in five FIFA World Cups, two Olympic Games and two Pan American Games. A prominent goalkeeper in the US Professional Soccer Leagues, LeBlanc played for nine clubs and in many championship games, winning with the Portland Thorns. LeBlanc was a member of the history-making Canadian team who won a Bronze Medal in the 2012 London Olympic Games. Her heroics in the 2011 Pan Am Games – stopping two penalties in the final – helped to secure a momentous team Gold for Canada. With 110 international appearances, LeBlanc was the beating heart of a Canada team that changed the face of football in North America. She is also a UNICEF Canada ambassador and was recently appointed Head of Women’s Football for Concacaf. Robert Pires is a French football star and current professional coach, whose remarkable legacy as a player is known the world over. Pires was a key member of an unforgettable Arsenal side, that won two FA Cups and two Premier League titles and were coined ‘The Invincibles’ for their dominant, unbeaten season in 2003–04. An outstanding professional for 22 years, Pires was also a talisman for France, Metz, Marseille and Villareal. In his eight-year international career, Pires earned 79 caps for France, winning both the 1998 FIFA World Cup and the 2000 UEFA European Championship. He is as an Ambassador for Arsenal, La Liga, The Premier League and Puma. As ambassadors, Gérard, Karina and Robert will play an invaluable role in promoting the work and vision of the newly-formed international social enterprise, which aims to unite and transform communities around the world through football. Spearheaded by His Royal Highness Prince Ali Bin Al-Hussein of Jordan, himself an influential figure in world football, AFDP Global delivers long-lasting social impact through football by funding specific initiatives, making equipment donations and providing other material support. AFDP Global also provides expert management and guidance to develop football and protect its values.